Thread: tie rods "too short"? Is it normal/okay for there to be only about a quarter inch of threads actually threaded in? I did a rough alignment yesterday and I'm really worried that to get the front wheels straight there really isn't much material left threaded in on either side. My roadster with power steering rack has 3/4" thread engagement on the tie rods. I would like more, but think 3/4" is on the border. I could not be comfortable with 1/4". Maybe another rack or replace with longer inner tie rods will help. I just replaced my inner and outer tie rods and there's definitely more than 1/4 engaged. Somewhere around an inch I believe. Any chance you have an early serial# (<100). The early frames had a 20mm wider track width when using wagon LCA. 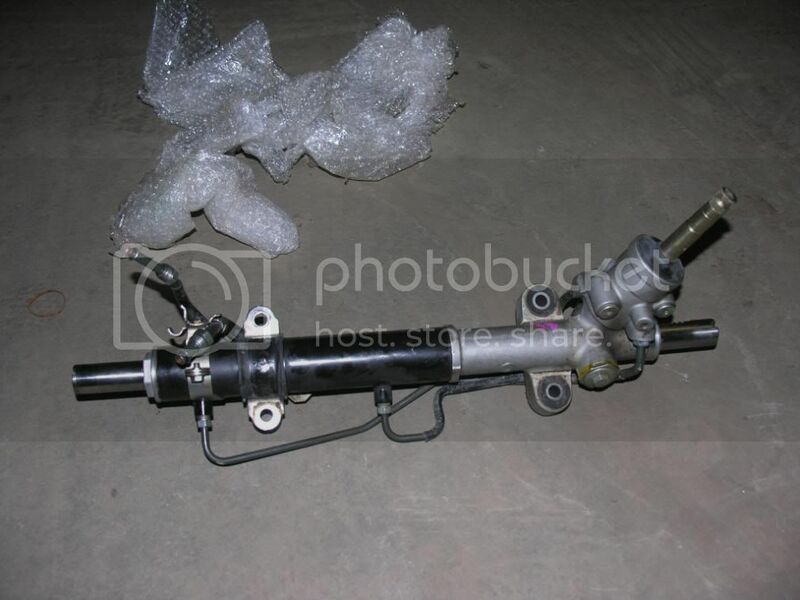 The early frame also had a offset steering rack that caused the thread engagement on the right side to be to short. Don't know if the wagon had different tie rods, but that's something to look into. Donor was a 2003 Impreza Wagon, VIN JF1GG29623G809580. How do I find the original center for the rack? Go lock to lock and then 1/2 way back. Did you switch to aluminum LCA? If so, they need to go into the inner holes as the were for sedans. I had #399, built with an '03 wagon. Never got a perfect, professional alignment, but was pretty dang close. IIRC, there was about 3/8 to 1/2 an inch on the passenger side, at least an inch on the driver side. Going lock to lock the wheels had nearly the same clearance to the frame so at most I was one tooth off center on the rack. So while I could see an offset happening, the fact that you're almost out of thread on both sides is a little weird, and I certainly wouldn't feel safe with 1/4inch of engagement. In a somewhat related, mildly amusing anecdote, I have a friend that works at a major OEM supplier of steering components that recently moved some manufacturing to mexico. In the chaos of the move, they accidentally clocked a key-way on a universal 90 degrees from what it should be, and nobody noticed until there were about 10,000 of them installed on vehicles already sold to consumers. Long story short, it wasn't a safety or performance issue, so there was no recall, but if you ever find yourself driving a 2018 Explorer and it seems to have a much tighter turning radius in one direction, your dealer should replace said universal free of charge if you complain about it. Last edited by phil1734; 07-18-2018 at 06:34 AM. They look like aluminum to me. I originally had close to an inch on the driver's side, but not enough thread on the passenger side to have the wheels straight and the passenger wheel connected. So I "borrowed" from the driver's side to get the passenger wheel connected and straight enough to take for an alignment (not realizing I was wasting money). The sedan LCA are 10mm longer than the wagon arms. The aluminum arms were not offered on a wagon. You should move the alum LCA to the inner holes. This will give you 10mm (3/8") more thread engagement on each side. Thank-you, I checked and they are indeed bolted through the outer holes currently. If I move them in I'm not only going to throw the toe-in off but I'm also going to mess up the camber right? Move the LCA in 10mm. Okay, it's a little weird, I took a closer look tonight and the rear bolts are through the inner holes but the fronts are not. Mechie3, I'm trying to figure out if I can use your extension but I'm not knowledgeable about Subaru steering racks (yet), how can I tell if mine has the "aluminum mounting ears" your website mentions? It will look like this. Sounds like you can fix your issue by just moving your arms in though. I would definitely go that route first as it's free and puts the suspension in the correct position too. The pass. side tie rod end on my 818S also had minimal engagement so I welded a nut to the tie rod end to gain thread depth. My pair of tie rod ends (both new and right side lengthened) are for sale as I have installed a Baer bump steer kit. PM me if interested. I'm moving the lower control arms front bolt locations in to where they should be (one done, one to go) as this fixes multiple issues (wheel rub at tight turn radius as well as thread engagement) plus I also plan to get the bump steer kit before realigning. I have the exact same issue, Alum LCA and hardly any thread engagement. just read this post went and checked my front end, sure enough they are mounted to the outer holes. Thanks for the answer.